Tim O'Brien examines a "station" at Littlebury, Essex, one of several linking Wandlebury with Hatfield Forest. In the Gog Magog Hills, just four miles south-east of Cambridge there stands an ancient and colossal earthworks called Wandlebury Fort. Shrouded in mystery and now shaded by a canopy of trees, this most eerie place is a popular summer-time picnic area. Few people munching their sandwiches on a balmy afternoon pause to wonder why a group of men toiled countless years ago to create the great mound; fewer still know of the old legend. Go to Wandlebury on Midsummer Night, if you dare, and in a loud voice exclaim: Knight to knight  come forth! A knight in shining armour will then ride out on his snorting charger and do battle with you. The story was taken so seriously in mediaeval times that the nearby university proctors forbade students from going to the Wandlebury site at summer solstice. If there are ghosts anywhere in the kingdom, Wandlebury is the place is the place for them. Spirits of many a crippled warrior should glide between the trees, as they have since Roman soldiers trudged along the Icknield Way close by. The earthworks, called a fort, would have been used by the ancient Iceni people to command the high ground there. But long before even that distant time, when men were scraping fish with flint tools, there existed a group of people whose skills and knowledge were not equalled for thousands of years. The history of Wandlebury earthworks, according to new evidence, spans not 20 centuries, but 50, and its original purpose was not military, but scientific. For the past five years, Tim OBrien, retired head of an international oil consortium, has devoted himself to researching the monuments mysteries. During this period, he has fed masses of data into a computer, and, after groping through the mountains of statistics gushing from it, he says he can tell us why the mound was built and, amazingly, he is pretty sure he knows who supervised the building of it 5,000 years ago. 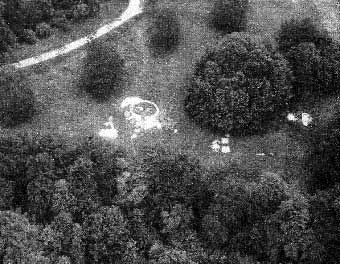 The Wandlebury site seen from a low aerial view. Wandlebury, says OBrien, was built at roughly the same time as Avebury, the early part of Stonehenge, and hundreds of other ancient stone circles around the country. A lack of local stone near Cambridge obliged the builders to use mud instead. As with the other monuments, the builders were able to plot and predict the exact movements of the sun, moon and stars through the heavens. But that was not all. OBrien has stumbled upon evidence which indicates that the builders of Wandlebury, and other nearby earthworks, knew that the Earth was a sphere. Nearly 5,000 years before photographs of the Earth taken from space finally quietened the Flat Earth Society, these people knew that the Earth was round. They even knew, to within one per cent., the circumference of the world. Tim OBrien, at 64, is an unlikely scholar, though he studied natural sciences, physics and geology at Christs College, Cambridge. He was, until his retirement a few years ago, managing director and chairman of the boards of Iranian Oil Operating Companies. As head of this consortium, he had to advise the Shah and it was while he was in Iran that he developed a passion for archaeology. 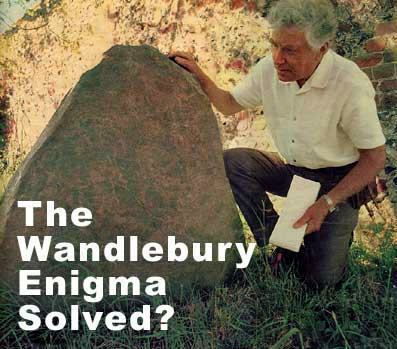 This new interest, coupled with his formidable mathematical brain, gave him a unique set of tools for solving the Wandlebury earth-works enigma. He recently published a detailed paper on his findings with the awesome title An Integrated Astronomical Complex of Earthworks at Wandlebury and Hatfield Forest from the Third Millenium BC. To research a subject requiring so much arduous on-site investigation, you need enormous reserves of energy and have be 100 per cent. Fit. Some of the locations which had to be visited would have daunted much younger men, but not the inexhaustible Mr OBrien. Youve got to keep your legs in order, he announced, dismounting the exercise bike standing beside the vast desk in his office (a converted stable in the garden). Then, with no hint of breathlessness, he pulled on a pair of stout boots, and prepared to stride out into the country. OBrien and his wife Joy who writes poetry live in Thaxted, Essex, and their interest in East Anglian monuments began when, a few years ago, they attended a lecture in London about Ley Lines, said by the late Alfred Watkins to have been surveyed in prehistoric times. These lines were thought to be straight tracks connecting landmarks like hilltops, ponds, and even church steeples. The chance discovery of one straight line inspired the OBriens to follow through with a detailed study of Wandlebury, and their discoveries now demand a complete reappraisal of the ancient history of East Anglia. Their line of great significance linked to Wandlebury with Hatfield Forest to the south, site of another great earthworks which they have now studied. Between the two earthworks the line passed through several well-known stone and earth landmarks in Essex. Some of the rocks, though clearly shaped by hand, have long stared archaeologists in the face. As if mocking us, the stones have defied explanation for years, and no one has made a detailed study of them. Plumb on the OBriens line, for instance, is Littlebury Ring, another earthworks, close to Newport, near Saffron Walden. The line also passes through the Uttlesford Mutlow, an ancient local meeting place, Eight Wantz Ways, a forest clearing, and a massive stone beside the A11 road at Shortgrove, near Newport, known locally as the Leper Stone. There is no evidence of a leper colony ever existing nearby. OBrien calls the stone the Shortgrove Monolith. To OBriens amazement, a close survey of his line (he calls it Line A), showed that it was not quite straight. It was, in fact, a perfect loxodrome. That is to say that wherever a person stood on the line between Wandlebury and another stone (the Priory Stone) at Hatfield Broad Oak, the North Star would always be at the same oblique angle. it was halfway within an inch or two! With his wife, he set off across country to look for more landmarks. According to his calculations (by using a lowest common denominator) there should have been 26 markers alone the line. These markers (he calls them stations) should have been at 1,430 metres intervals, and this distance (his megalithic mile) relates exactly to calculations by other experts of prehistoric units of measurement. Of the 26 stations which we think originally existed along Line A, we found evidence of 11 in exactly the right place. There were also several of the distinctively shaped stones near the line, which were probably moved by farmers years ago because they impeded agriculture, said OBrien. There is evidence in local records offices of at least one such operation. OBrien estimated that the chances of so many markers being in the right place by pure chance was many millions to one. "Stations" in a straight line from Wandlebury to the lake, linked several well known Essex landmarks, including those at Newport, Shortgrove, Great Chesterford and Littlebury. As OBrien delved deeper into the subject, he was constantly reminded of the ancient scientists accuracy. They would have had only primitive equipment with which to do the work, such as plumb lines, artificial water horizons (needed to give astronomers a level plane from which to make eye-level observations of the rising sun), trestles and lines, yet they achieved amazing results. Satisfied that his Line A was not coincidence, OBrien turned his attention to the earthworks site itself. This began with a meticulous study of Wandlebury which he estimated would have taken 600 men at least 130 days to build. This archaic highway, incidentally, connected Kings Lynn with the ancient Ridgeway Path, straddling England and passing close to Avebury, Stonehenge and Silbury Hill (Europes largest manmade monument). The survey showed that Wandlebury carved a perfect circle through the hill, save a corneal bump at one side. A plan looks like an eye. The established view, endorsed by the Cambridge University Department of Archaeology and Anthropology, is that the mound was an Iceni fort, and certainly it could have been used for military purposes at some stage of its history. However, OBrien believes that the accuracy of the circle is significant here. Warriors toiling for months to construct so massive a monument would have been disinclined to clutter their military minds with such geometric precision. The earthworks has a circumference of 1,000 yards, and a diameter of 300 yards. The outer bank is now only 14 feet or so above the bottom of the inner ditch, but OBrien thinks that when it was built the bank alone would have stood 12 feet high. Cut into the bank, and still clearly visible, are six indentations. The dents, OBrien says, were used for observing the movements on the sun, moon and stars. OBriens calculations show that the ancient astronomers would have had a solar-year calendar, and a full 19-year lunar calendar at Wandlebury. The odds against random chance have, by now, rocketed to 10 million to one, says the OBrien computer. The earthworks at Hatfield Forest including Portingbury Hills, and a large lake and ditch, also indicated that midsummer sunrise and other events were marked and observed. The lake at Hatfield Forest, and the 50ft wide ditch emerging form it, is enclosed by ancient woodland and endowed with the same mystical atmosphere that exists at Wandlebury  not oppressive, but eerie. The lake itself was formed only 230 years ago by the damming of a stream, but one of its shores forms the continuation of the sweeping half-circle of the ditch into which the water has also spilled. OBrien believes that the ditch originally went a full circle, forming an observatory like Wandlebury, but half as big again. Around the lake are several of the distinctively shaped boulders found along Line A. Line A itself passes through a corner of the lake and continues for a short distance to Hatfield Broad Oak, a picturesque Essex village. Close to the ruins of an old priory, OBrien found his last stone (the Priory Stone) buried in the garden of a private house. The stone does appear to mark the end of Line A, but there are other lumps of rock close to all the Line A stations which also have geometric significance, OBrien thinks. If OBriens theories are right, they would show that the surveying was done 2,000 years before Pythagoras. However, Pythagorean triangles (right-angled triangles with sides of a 3 : 4 : 5 ratio) figure prominently in the calculations. At Wandlebury, for instance, OBrien constructed the largest 3 : 4 : 5 triangle which could be accommodated, with one line pointing towards the summer solstice gap. The right angle was on his Line A, and to his amazement the spot marked by a stone set deep in the ground. This really was a thrilling and unexpected discovery. We now knew how the initial alignment of Line A was obtained, and that it was mathematically tied to the direction of midsummer sunrise, said OBrien. It meant that anywhere along Line A somebody could have easily worked out the direction of the midsummer sunrise. There is evidence at Wandlebury of other small ditches. These, OBrien calculates, were used by the builders as eye-level water horizons. Each of the dents in the Wandlebury bank has several astronomical purposes. From the exact centre, for instance, there is one pointing towards the North Star. Another points the way to the midsummer sunrise, and another to the lunar summer maximum. The precision of the builders has helped OBrien to calculate when Wandlebury was built. Because of the Earths lazy drift through space there is a minute deviation in the position of sunrise. The cycle takes 20,000 years to complete, but it gives experts a clock to look at. Assuming therefore that the builders constructed Wandlebury so that the rising sun would have been exactly in the centre of the dent in the mound, OBrien can say, to within 200 years, when it was build. From our calculations we believe that Wandlebury was constructed no less than 4,500 years ago. That is about contemporary with Avebury and the first part of Stonehenge." During his study, OBrien has, rather like St Paul, sought to disprove, rather than prove, some of his theories. But as fact piled upon fact he found it harder to escape the conclusion that Wandlebury was a sophisticated, if unwieldy, calendar. It may have been used to calculate when crops should be planted and harvested, but more likely it was for assessing quarter days and religious festivals. A few surviving customs, in particular the old village maypole, may originate in local peasants mimicry of the wise mens actions. Intricate mathematical comparisons between Avebury and Wandlebury established a close similarity between the two circles which, OBrien says, were built not only about the same time but almost certainly by the same group of people. Indeed, most of Britains monuments are so similar in design that some experts (OBrien included) have suggested they were built form the same pattern book. A sort of inspectorate of monuments probably toured sites to check that the work was done properly. It was the amazing accuracy of the ancient builders which most nagged OBriens mind, in particular the precision of his Line A. This line, as far as he has ascertained, is unique. Had the old astronomers wanted just to know the direction of midsummer sunrise from anywhere along the line, accuracy of the kind they achieved would have been quite unnecessary, pondered Mr OBrien. After long consideration he concluded that what the builders must have been calculating was the difference in latitude between Wandlebury and Hatfield Forest. The direction of sunrise depends, of course, on the latitude from which it is observed. The original surveyors would have had a system for measuring circles, and indeed there is evidence of some ancient races having used the same 360-degree system that is used today. Assuming that they used a 360-degree circle they would have calculated a difference in latitude between the points of 0.299°. They would have known already the exact distance on the ground along Line A, and so the sagacious builders would have had to do some fairly simple multiplication (Line A distance time 360/0.299) to obtain the polar circumference of Earth. OBrien has done his arithmetic and found that they would have been no more than one per cent. out, a matter of a few miles. His views will not please archaeologists, some of whom would prefer the monuments to go away (there being so little about them that can be certain). Several established experts in the history of astronomy have studied OBriens paper, but most are reserving judgement, preferring to think it over. As Archie Roy, Professor of Astronomy at Glasgow University, said after reading the paper: The conclusions are so astounding that one immediately has to step back, look again, and ask, Can this really be so? Had he written this paper 20 years ago, people would have laughed at it, but recent studies have revealed a picture of an elite in Britain who seem to have run the country. However, not all experts are quite so charitable as Professor Roy. One man who has spent many years studying and writing about Britains heritage of megalithic observatories is Professor Alexander Thom, former Professor of Engineering Science at Oxford University. He says he is not yet persuaded that Wandlebury is anything but an Iron Age fort. If Tim OBrien ha a fault, it is his innocent assumption that we are all as clever as he is, though he would be terribly embarrassed if he knew that he were talking above our heads. He is a most placid man, but becomes agitated when the topic of archaeologists and historians is raised. Many of these objects, even those as massive as Wandlebury, may well have been built for purely practical use. The fact that midsummer rites may have been danced there during the Middle Ages does not affect their original purpose. Joy OBriens life revolves round her poetry, her husband and her belief in his work. She says: This study is very important. If these findings are correct they open the doors of time, and make sense of much that seems nonsense in history. They draw together many mysteries. By lighting up the past, this information could help us in the future. For OBrien himself the work goes on: The astronomically aligned earthworks and megalithic erections at Stonehenge, the Cyclopean earthworks at Silbury Hill and Avebury, and the solar and lunar observatory at Wandlebury are, quite simply, there  monuments to the technical expertise of a culture which, according to traditional archaeological thinking, never existed, although the monuments have survived for nearly 5,000 years. There is no written evidence nor any substantial oral tradition in Britain concerning the builders of our megalithic monument, which is why our pre-historians have largely neglected this important quest.